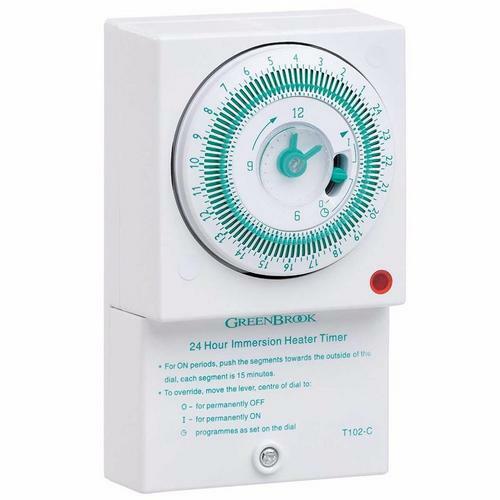 The Greenbrook 24hr mechanical timer is a mechanical power timer, meaning no fault in chips is possible, however it still operates quietly and is robustly made with a long life of service in mind. Great Mechanical time clock - no nonsense design and much easier for customers to set than equivalent digital types. Wiring is straight forward - the supply & load terminals are easily accessible at the bottom - much easier than older styles I've used in the past. Also seem very reliable. ONly replaced this on like-for-like owing to a DIY'er replacing immersion fuse with 30A fuse wire on a blown element - hence goodbye time clock!I received the updated "curved" version - identical in every way apart from the front profile is now curved rather than square.Great product - Great Price & Great Service! 5/5. If the red light is not lit when the timer is on does this suggest there is a wiring problem or a faulty unit? The clock is working and there is a mechanical sound of the timing device but I'm not sure if the emersion heater is working due to the lack of a red light?